Imagine if you could replace all your speakers for a single one? That’s not as far fetched as it seems, as a new kind of speakers is already being developed at the University of São Paulo, Brazil. These high performance omnidirectional speakers have 12 sides, each with a single speaker turned at a certain angle to cover 360 degrees both horizontally and vertically. When you listen to the music coming from a sound system, when you move from the front to another side in the room, the sound changes, but these new speakers can send the music to variable directions, eliminating that problem. The speakers are connected to an amplifier, responsible for the distribution of music in a uniform manner to all the acoustic system. With the omnidirectional there’s no need for extra equipments to be installed, and it could be used both outdoors and indoors. In Brazil we have a thing called Electric Trio, which is a truck surrounded by speakers for the carnival in Bahia. According to the responsible for this research, a single dodecahedra speaker could replace all of those speakers, and still keep the party going on. Since you’ll need only one cable, this could also reduce the installing costs. 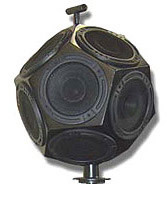 The dimensions of these dodecahedra speakers could be variable, changing the sound and power of the speakers. The researches are looking for investors to build the speakers in large scale. Anyone interested?